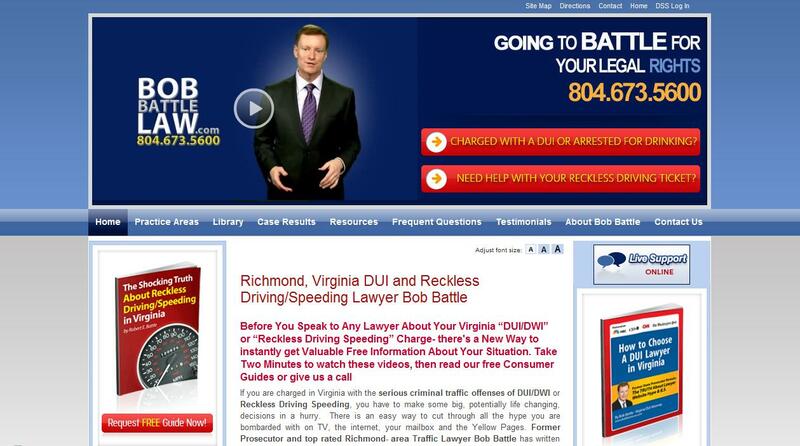 "My website has dominated the search engine results for my practice"
When I joined Foster Web Marketing, my goal as a solo DUI and reckless driving lawyer in Richmond, Virginia was to gross $200,000 in a year. I actually wrote that number down in an exercise in a time management book by marketing guru Dan Kennedy. I also wrote that $200,000 number down while writing down my goals for 2006. Last year, in a recession, I grossed in excess of $450,000 while reducing the number of hours I worked to just over 30 hours/week. In 2009, I am on pace to gross around half a million dollars, have worked 0 weekends and averaged four days in the office per week while running my law practice and a lawyer marketing program. My wife and I just purchased and are building a dream second home in the beautiful mountains of Wintergreen, Virginia. Our children, who are 8 and 4, already have their college education paid in advance. My website has dominated the search engine results for my practice areas for several years now. The Foster Web Marketing team has also taught me the skills to remain dominant for as long as I desire. In addition to the unmatched and awesome talent that the Foster Web Marketing Team possesses, the quality that is equally important to me is TRUST. I absolutely know that the Foster Web team is dedicated to delivering not just good results, not just a positive return on my investment, but to constantly blow me away with the results they deliver. That being said, my advice is simple. When Tom Foster says jump, I say, "How high?" Thus in 2009, even though my results were already great, Tom offered his "SWAT conversion program" to turn more website visitors into clients. I signed on without hesitation. The results, as usual, have been off the charts. I have gone from under 10 requests a month for my consumer guide for reckless driving/speeding to 62 requests in May and 76 requests in June 2009. My website already has convinced hundreds of clients per year that I am the best choice for their case before they have even spoken to me! Thank you, Tom Foster, and all of my friends and partners in success at Foster Web Marketing.